1. Click the "Register" link at the top right side of our site. 2. Enter your Account, Shipping, and Billing information. Click "My Account" in the top right of the page. Click the "My Profile" Link. Click the "Login" link at the top right hand side of our site. Under the login box you'll see a link that says "Forgot your password? Click here". That link will send an email to you with your password. Click on either "My Cart" or "checkout" in the top right of our site. Find the item you wish to remove and click the "remove" button. I have a question on my charges! Click the "My Account" link at the top right hand side of our site and go to "My Orders" to review your orders. You may compare your order history on our website, with your financial records. If you have further questions or concerns, please call us. I need a copy of my receipt/invoice! Spendlessautoparts sends out an email receipt to the email address you provided during checkout. If you need this email again, or need more specific invoice information, please call us immediately. For Pay-Pal Transactions, you wil need to contact Pay-Pal. SpendLessAutoParts will send a confirmation email of your order to the email address you provided upon checkout. All Shipping Addresses must have a physical street address. If you did not provide an address and you have already paid for your order, please call us immediately. SpendLessAutoParts.com cannot ship to P.O. Boxes. If you provided a P.O. box address and you have already paid for your order, please call us immediately. Please refer to our Shipping Policy for detailed information. Look at our returns page! If it is necessary to return an item, Please call us immediately. There may have been an error with our carrier! Please call us immediately so we can sort it out. An item is missing from my shipment! We are sorry for the inconvenience, please call us immediately so we can sort it out. My product is missing parts! If you feel that you have received the wrong product, please call us immediately. Orders placed on "In Stock" items before 3:00 P.M. will ship same day. Orders placed on "Out of Stock" items or orders placed after 3 P.M. will ship in 1-3 business days. Also, after placing your order, you may click the "My Account" link at the top right hand side of our site, and go to "my Orders" to track the status of your order. When will I receive my product after shipping is confirmed? 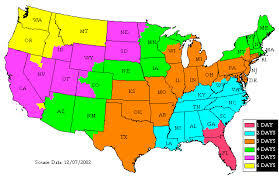 International Orders and orders outside the Continental United States will vary in shipping length.